September 11th is day that will forever be a day of infamy, a day of shock and heartache, a day we wish never happened. But it’s also a day that must be remembered and shared with future generations because it did happen and it forever changed the world as we know it. …..watching the second plane crash into the tower. ….talking to G as he drove to his 24-hour shift as an EMT in LA and asking him to not be a hero if something happens. He humbly replied, “But it’s my job”. ….going to school and waiting for more news. ….my Economics teacher telling us how bad this would be for our economy. ….being irritated that the flags weren’t immediately lowered to half-mast. ….being unable to take my eyes from all the news reports that night and the days following. It was all so scary. I knew our country would never be the same. ….people rushing to help pull people from the buildings. …wearing red, white, and blue proudly. …candlelight prayer vigils lighting up the night. …everyone singing God Bless America wholeheartedly. …the unity of our school, community, and country in the months that followed. …trusting God that he was in complete control. So today we need to all take some time to remember because it’s a day to tell our children and grandchildren about. 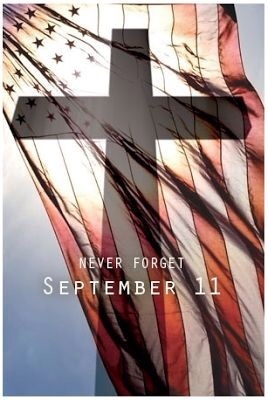 A day to remember the lives lost….the men and women that perished in the towers, on the planes, at the Pentagon. The men and women that rushed in when everyone else was rushing out. And we can’t forget to lift up prayers for the kids that were suddenly left with only one parent or maybe none at all. And offer thanks for the people that lined up to give anything they could to help. The heroes of that day and the days that followed. And we can’t forget the lesson we learned: there is bad in this world, but there is also good. And good can win. ← I love me…I love me not.